Libya - On 2 February, IOM delivered non-food aid to 300 displaced families in Awal, a remote village in Libya’s western mountain range, close to the Algerian and Tunisian borders. The distribution followed an assessment of the community’s needs and included blankets, pillows, mattresses and hygiene kits. It was implemented in close cooperation with a local partner agency – the Al Salem Bani Walid Association. Approximately 2,300 people from Libya’s Tuareg region fled to Awal when the civil war erupted in 2011. Today, Awal consists of 220 houses that have been completed and are habitable, while another 150 houses need further renovation. “Life is hard here and we have gone through a lot. We built the village ourselves,” said one of the beneficiaries. Due to Awal’s remoteness, timely medical assistance rarely reaches the residents and the community suffers from a chronic lack of economic opportunities and jobs, he added. “This aid was badly needed by these families. Conditions here are tough, they don’t have jobs and they can’t afford to pay for these items,” explained IOM Libya’s Abdulrahmen Saleh, who took part in the distribution. According to IOM Libya’s Displacement Tracking Matrix, there are an estimated 313,236 internally displaced persons (IDPs) in Libya, most of whom have been displaced from areas in the north-east and north-west of the country, particularly in Sirte and some parts of Benghazi. 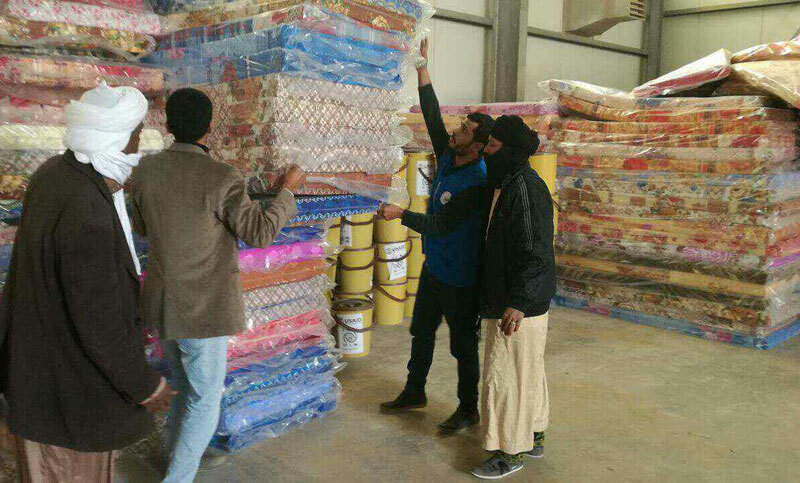 In partnership with the Al Salem Bani Walid Association, IOM is also supporting people displaced from other conflict-affected areas, such as Ubari and Sirte, through the provision of core relief items and hygiene kits. The operations are funded by the Office of US Foreign Disaster Assistance (OFDA).